I was hankering to try some cambodian style noodles. I thought I’d never had this before, but then remembered that I had some at Kirirom near Seattle. Sadly, that place is no longer open, but that’s ok, I’m thousands of miles from Seattle. New Phnom Penh is indeed open, and we headed out there to try cambodian style noodles for the first time… at least for my first time in Philly. H/A and his rainbow drinks, which he orders whenever he gets vietnamese/cambodian food. Is this cambodian? Is thish vietnamese? No idea, but he’s into it, and it is crazy looking. None of us were cambodian, or vietnamese for that matter, so we had no idea what we were doing. When I ordered some noodles, they asked if we wanted bread. 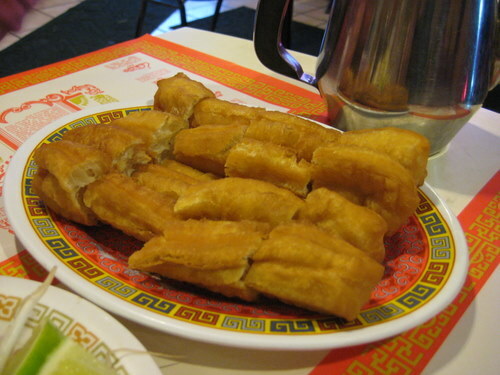 H/A talked with her, possibly in chinese, and eventually, they brought out this fried dough stuff. E said it looked like big churros, without the sugar and cinnamon. And it really did. It was basically fried dough that you could just eat on its own, or dip into soup. Greasy goodness. 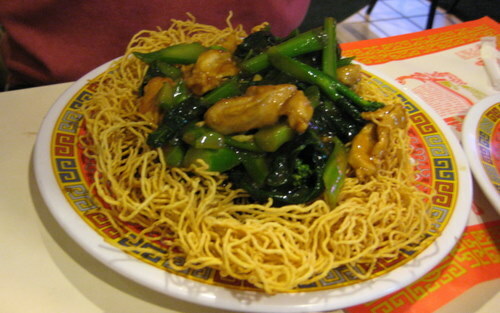 H/A ordered a chicken and broccoli pan fried noodle dish. This really could have been found on the menu of many different restaurants – chinese, vietnamese, etc., but regardless of what kind of food this was, it was good! E had wanted a sour seafood soup dish, but unfortunately, the ladies who worked there told us that the chef who could make that had gone home already. Oh yes, we were here on a sunday night, and we were the only ones here. And um, well, it’s not in the friendliest or safest of neighborhoods of south philly. Not that I’m an expert, but I’m just saying. So without being able to get that soup, the lady suggested shrimp and noodles, and E just agreed! 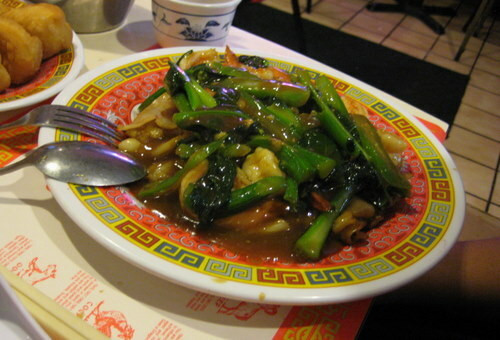 And out came this dish with shrimp, chinese broccoli, and side rice noodles. I love food like this. Simple and hearty. Again, who knows what type of cuisine this is. Plain and simple, E found it delicious. So indeed, I went with the soup, and I wasn’t sure which to order or what any of them were, so I just got the combination noodle. There’s no explanations on the menu either, so I really had no clue. I just took a guess. This is not pho. 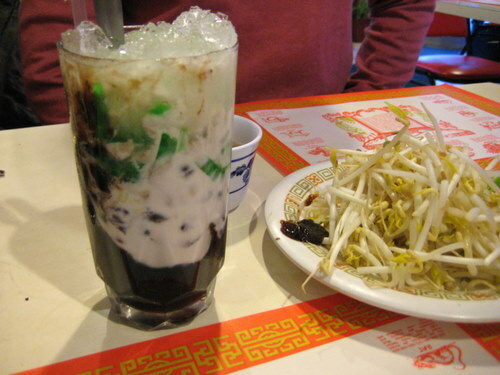 It’s got rice noodles like pho, and broth, and other stuff. But the broth is not beef based. It’s much lighter. 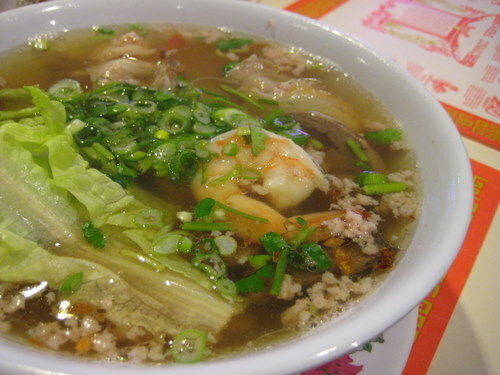 This soup came with liver (um, I skipped), pork, fish cake, and shrimp. It’s a good broth, with a strong smell. There’s no need to adulterate it all, with hoisin sauce, or sriracha, or anything really. Just dump some sprouts in there, maybe put a squirt of lime in there, but that’s really it. It’s just fine as is. The food here is super cheap. Super good, too. The service? Eh… well, it’s not one of those places you go to for the service. We got our water… way after we got our food. Most of the time, we were left to ourselves. The ladies went back into the kitchen and stayed there most of the time. I kind of think that when we came in, they were disappointed. They probably wanted to go home and here we go showing up and ruining their perfectly good sunday evening. But who cares, it’s a hole-in-the-wall joint in a scary neighborhood with good food. Come out and visit during the day, it’s fun!